And yet, 66 percent of the African-American voters we talked with, including voters who skipped voting in 2016, signed an email pledge to vote in 2018. These pledges do not guarantee a vote next year, but are promising indicators that voter turnout can be increased significantly, especially with long-term engagement. 1. WHAT HAPPENED IN 2016: There was a profound disconnect — especially on economic issues — between working-class African-American voters and the Democratic Party. 48 percent of black voters surveyed think it makes no difference for them economically whether Democrats or Republicans are in office. Disappointment with the candidates was also a factor: 46 percent of black voters, both those who cast ballots in 2016 and those who did not, believe voters’ dislike for both Donald Trump and Clinton was the primary reason for the decline in voter turnout. 2. WHAT’S HAPPENING NOW: African-American voters strongly disapprove of Trump. There is ongoing civic engagement in the black community, but ties to the Resistance are weak. 84 percent of black voters disapprove of Trump’s job performance, but most say they’re unfamiliar with the Resistance. Despite the low recognition of the Resistance, a third of black voters say they identify with it. 26 percent of African-American voters say they have taken at least one political action since the election, a higher rate of activism than white Clinton voters in central Ohio reported during our March survey of swing voters. 3. HOW TO BOOST VOTER TURNOUT IN 2018: There are promising signs that early and direct outreach to African-American voters can increase turnout. 66 percent of black voters signed a pledge to vote in 2018 when engaged by canvassers at the door; among 2016 non-voters, 51 percent signed the pledge. Progressive politicians need to boldly address black voters’ concerns, many of which white working-class voters share. We heard repeatedly about voters’ struggles with declining wages, underemployment and unaffordable health care. Our findings are based on “front-porch focus groups” — interviews held in person at voters’ front doors. Working America canvassers conducted the interviews June 19-30, and we focused on African-American registered voters in working-class and working-poor neighborhoods in Columbus and Whitehall, Ohio. Our sample included 2016 voters as well as those who did not vote that year in order to gain insight into what factors motivated participation and drove the drop-off from 2012 levels. Among the group of registered voters we surveyed, 58 percent cast a ballot in 2016, 18 percent voted in 2012 but not last year and the remaining 24 percent were less frequent voters. By comparison, 86 percent4 of all African-American registered voters in Ohio cast a ballot in 2016. Among our survey participants, 86 percent voted for Clinton, 2 percent voted for Trump, 2 percent voted for another candidate and 10 percent wouldn’t share or said they didn’t remember their vote. For more detailed information about the survey participants, see the methodology section at the end of this report. The sharp decline in African-American voter turnout in Ohio was a critical factor in Clinton’s defeat. Statewide, African-American turnout plummeted nearly 10 percentage points, falling from 71.7 percent in 2012 to 61.8 percent in 2016. Why did so many black voters, the core of the Democratic base, stay home? In our interviews with working-class African-American voters, we found that many of them are feeling economically stressed and losing hope that the political system can improve their lives. The conversations we had with working-class African-American voters in central Ohio are a wake-up call for Democrats. Nearly a decade after the 2008 recession, many black voters say they’re still struggling economically. Only 19.6 percent say their economic situation has improved over the last 10 years — and that number is lower still, 16.1 percent, for people who didn’t cast a ballot in 2016. The voters we talked with identified jobs and the economy as their No. 1 issue. Troublingly for Democrats, 48 percent of African-American voters surveyed say it makes no difference to their economic well-being if Democrats or Republicans are in power. African-Americans who didn’t vote in 2016 are even more despairing, with 66.4 percent saying they’re no better off under either party. Our canvassers talked with one voter after another who was struggling to make ends meet and didn’t see politicians from either party addressing their problems. Voters who didn’t cast a ballot in 2016 were even more unsparing in their criticism of the political system. 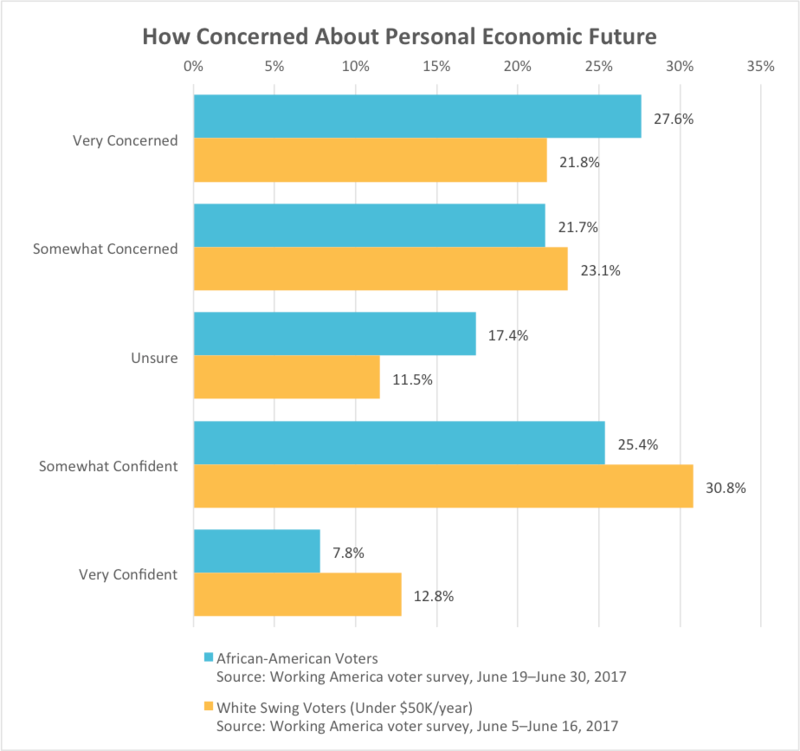 The black voters we talked with are worried about their personal economic future: 49.3 percent of black voters say they are somewhat or very concerned about their personal economic future; just 33.2 percent say they are somewhat or very confident about their future economic prospects. 44.9 percent of lower-income white swing voters are concerned about their personal economic future, 4.4 points below the concern level of black voters of all income levels. 43.6 percent of these white voters are confident about their personal future, 10.4 points more confident than black respondents. The greater economic stress black voters are feeling in their lives was reflected in many comments we heard about the day-to-day struggles they experience. 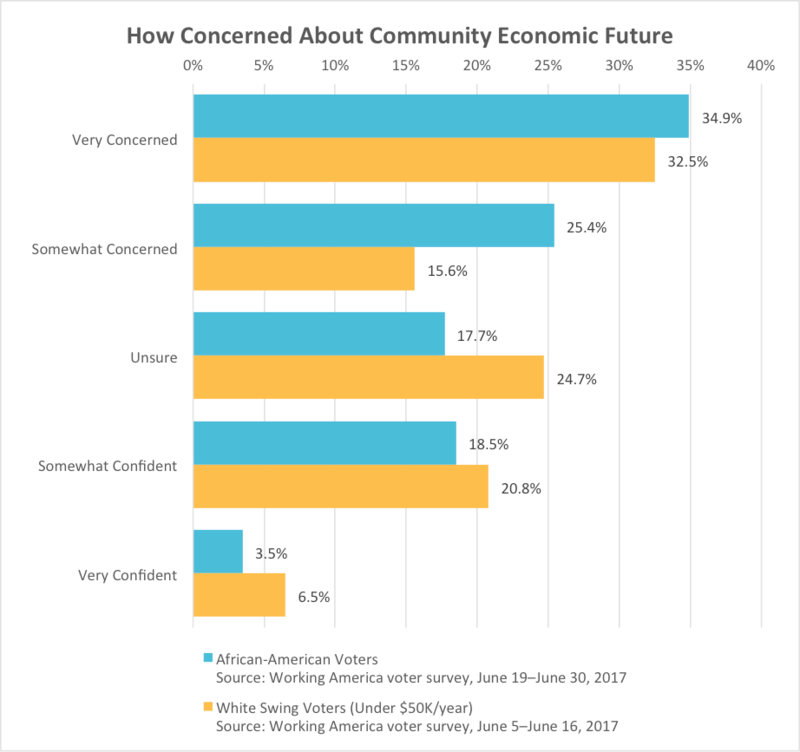 The black voters we talked with are even more worried about the economic future of their communities: 60.3 percent of black voters say they are somewhat or very concerned about their community’s economic future. Just 22 percent say they are somewhat or very confident about the well-being of their community. 48.1 percent of lower-income white voters are concerned about the economic future of their community, 12.2 points less than the concern level of black respondents. 27.3 percent of lower-income white voters are confident about the economic future of their community, 5.3 points more confident than black voters. The picture that emerges is one of African-American voters who are personally, and as a community, more economically vulnerable and isolated from economic opportunity. The greater anxiety of black voters is an indication of the severity of the economic stresses faced — and the urgency progressives should feel about addressing their concerns. We asked our survey participants for their thoughts on the drop in voter turnout in 2016. Only 8.3 percent thought the decreased turnout was due to President Obama not being on the ballot; 45.9 percent believed the primary reason turnout fell was a dislike of both Trump and Clinton. This sentiment was slightly stronger (49.3 percent) among those who did not vote in 2016. Our respondents’ second most common theory on why voter turnout dipped (13.7 percent chose it) was that black voters felt their vote didn’t matter. Anthony stated his case more forcefully than most respondents, but many others shared his sense that voting in America makes no difference. Most of the African-American voters we talked with are deeply concerned about Trump, and they are more likely than white Clinton voters we surveyed in central Ohio to report taking a political action since the election. However, black voters are largely unfamiliar with the Resistance, which suggests there is an even greater potential for engagement and activism. Central Ohio’s working-class African-American voters overwhelmingly disapprove of Trump. Altogether, 84 percent of voters we surveyed say they disapprove of Trump’s performance as president, with 67.9 percent expressing strong disapproval. Even some Trump voters we talked with now have serious concerns about the president. Since the election, 26 percent of the black voters we surveyed say they have taken an action such as signing a petition or attending a march. That is a higher rate than among the mostly white Clinton swing voters we recently surveyed in central Ohio. Only 18.3 percent of them reported taking an action since November. However, the Resistance hasn’t made a big impression on the African-American voters we spoke with. Only 33.9 percent say they’re familiar with the term “Resistance.” After hearing canvassers explain the term, 32.3 percent said they identified somewhat or very closely with the Resistance; 26.7 percent said they don’t know or are neutral; and 40 percent say they don’t identify closely or at all with it. Kristopher, 20, a Clinton voter from southeast Columbus, said he hadn’t heard of the Resistance, but he’s “all for the protests.” He hasn’t participated in any yet, but he has signed petitions and fervently opposes Trump. “My kid brother knows better than that man,” he said. Separately, we asked African-American voters if they were active in any organizations such as a community group, church, PTA or union. Among respondents, 16.3 percent say they’re active in a faith group, followed by 4.3 percent involved in a neighborhood organization, 3.5 percent in a PTA and 2.1 percent in a labor union. However, the largest share of black voters — 66.8 percent — say they’re not active in any organization. Given this rate of civic participation, and the overwhelming opposition to Trump, it seems that while there are challenges, the potential for mobilization efforts in concert with other members of the Resistance is considerable. A recurring theme we heard from these voters was the lack of time they have to take action. Many people said they want to be more active in their community, but spend so much time working or looking for work it’s just not possible. In 2018, Ohio will hold elections for U.S. senator, governor, 17 of 33 state Senate seats and all 99 state representative seats. Should black voter turnout remain at 2016 levels next year, Democrats face an uphill battle to win these crucial elections. However, our survey findings offer valuable guidance on how to build a common agenda, reverse the decline in turnout from 2016 and inspire African-Americans to vote next year. Progressive politicians need to speak to the concerns of African-American voters — and jobs and the economy is by far their No. 1 issue; 32.5 percent of black voters selected it as their primary concern. Health care ranked second at 23.4 percent, and together public safety and police accountability garnered 13.2 percent of responses. We heard repeatedly from voters who fear they’re stuck in an economy where it’s impossible to make progress. As part of our door-to-door outreach, we asked each voter to sign a pledge committing to vote next year. Although just 57.9 percent of the voters we surveyed cast a ballot in 2016, 66.9 percent of them signed cards pledging to vote in 2018. A voter pledge is not a vote, but as part of an early and robust outreach program, it’s an important tool for increasing turnout. Studies by the Analyst Institute show that voters who sign a pledge card and have it mailed back to them before an election are more likely to vote. And our own clinical studies suggest that supplementing that effort with tailored digital communications can further increase voter turnout. Our analysis of the 2016 election returns in Ohio, as well as Michigan and Wisconsin, found that Clinton underperformed Barack Obama in the urban counties where most African-American base voters live and in the exurban counties where many white working-class voters reside. To turn around those results in 2018, progressives must reach out to both groups — and the messages don’t have to be that different. Although African-Americans still face unique challenges, there is clear evidence from this and previous Working America “front porch” projects that the economic concerns of black and white working-class voters are broadly similar. Our recent survey shows that Trump swing voters in Ohio overwhelmingly support progressive economic ideas like paid family leave and curbs on outsourcing. That project revealed that a considerable share of Trump voters are not so ideologically committed that they cannot be swayed toward progressive candidates by a popular and positive economic agenda. Forcefully advocate for an economic agenda that serves working-class voters, including black voters, who say their primary concern is jobs and the economy. Nearly half of black voters say Democrats don’t do any better for them economically than the GOP. Progressive politicians can distinguish themselves by fighting for a bold economic agenda that honestly addresses the deep anxieties of working-class voters of all races. Incremental solutions focused on narrow segments of the population are not compelling to workers worried about losing their jobs at any moment and experiencing community-level distress. We must fight harder to win economic security for all working-class Americans. Reach out right now to African-American voters at their doors and keep working through 2018. There are promising signs that early and direct outreach to African-American voters will boost turnout. When we contacted black voters at their doors for this project, even infrequent voters pledged to cast a ballot in 2018. The promise shown in this early contact stands in contrast to the approach of waiting until the election to engage these voters. While a pledge is not a vote, clinical studies show it is an effective tool for increasing turnout. Support activism in the black community. Central Ohio’s black voters overwhelmingly disapprove of Trump and they are at least as politically active as Clinton swing voters. Fight and highlight voter suppression. Voter suppression, including purges of African-American voters from registration rolls, almost certainly contributed to the decline of black turnout in Ohio and elsewhere. Progressives need to support and expand on the work of groups like the A. Philip Randolph Institute, which is challenging Ohio’s purge of black registered voters. Unlike traditional public opinion polling, which is based on a random sample of people representative of a given population, we selected African-American registered voters from Columbus, Ohio, who cast ballots in 2012 but not 2016 or had a Catalist Vote Propensity score of 20 to 80 (on a scale of 0 to 100, where 0 indicates no likelihood to vote and 100 suggests a certainty to vote). The group we surveyed had a voter turnout rate in 2016 of 57.9 percent; that compares to the 86.1 percent turnout rate of African-American voters statewide.3 We sought these lower-turnout voters so we could explore political disaffection and civic disengagement in 2016. Though we did not seek a representative sample of all African-American voters in central Ohio, we did seek to interview voters who broadly reflect the demographic and political makeup of black voters in the region. In our sample, 83 percent had annual household incomes below $50,000; in Franklin County, which includes all the areas we canvassed, 72 percent of black voters have household incomes under $50,000 a year. The estimated household income of voters we surveyed was $39,000. From June 19 to June 30, we canvassed 582 black registered voters. Among survey participants who cast a ballot, 85.7 percent voted for Clinton, 2 percent voted for Trump, 2 percent voted for another candidate, and 10.4 percent wouldn’t share or said they didn’t remember their vote. As far as a demographic breakdown, the canvassed population skewed female over male (58.6 percent to 41.4 percent), and all the voters we spoke with were African-American. Canvassers sought the respondents’ thoughts on why black voter turnout declined in 2016, what they were feeling about politics under President Trump, and how turnout can be increased in 2018. Individuals could choose not to answer a specific question, which resulted in slightly different totals for each response. We deployed canvass teams in Columbus and Whitehall, Ohio. The Columbus neighborhoods we went to included Easthaven, Mount Vernon, Northland and North Linden as well as neighborhoods near the suburbs of Canal Winchester, Gahanna and Worthington. Since 2003, Working America has mobilized working people who don’t have the benefit of a union at work to fight for good jobs and a fair economy. As the 3-million-member community affiliate of the AFL-CIO, we unite working people in urban and suburban communities around a shared economic agenda. 1One under-reported factor in the decline in African-American turnout was Ohio’s purge of black voters, an issue the A. Philip Randolph Institute is litigating before the U.S. Supreme Court. African-Americans were seven times as likely as white voters to be removed from Ohio’s registration rolls between 2012 and 2016. Still, turnout dropped even among the black voters who remained on the rolls, which suggests disenchantment with the political process. 2According to U.S. Census Bureau data, there were approximately 80,000 fewer black voters who cast ballots in 2016 than in 2012. Exit polls among black voters show 88 percent voted for Clinton vs 8 percent for Trump. While the exits polls have a degree of imprecision and do not measure vote choice among non-voters, it is reasonable to infer that these non-voters would have performed in a roughly similar way. Clinton lost Ohio to Trump by 430,000 votes, hence 80,000 additional black voters could have cut her margin of defeat by up to 19 percent. 3This turnout rate of 86 percent reflects the share of black registered voters in Ohio who cast a ballot in 2016, and so it differs from the more commonly cited black turnout rate of 62 percent, which measures the share of black voting-age citizens in Ohio who cast a ballot in 2016. 4This turnout rate of 86.1 percent reflects the share of black registered voters in Ohio who cast a ballot in 2016, and so it differs from the more commonly cited black turnout rate of 61.8 percent, which measures the share of black voting-age citizens in Ohio who cast a ballot in 2016.